Manhattanhenge – sometimes referred to as the Manhattan Solstice – is a circumstance which occurs twice a year, during which the setting sun aligns with the east–west streets of the main street grid in the borough of Manhattan in New York City. The neologism is derived from Stonehenge, where the sun aligns with the stones on the solstices with a similarly dramatic effect. The word was popularized in 2002 by Neil deGrasse Tyson, an astrophysicist at the American Museum of Natural History. The term applies to those streets that follow the Commissioners' Plan of 1811, which are laid out in a grid offset 29.0 degrees from true east–west. (The 29.0 degrees should be added to true east and west, making the western bearing approximately 299.0 degrees.) During Manhattanhenge, an observer on one of the gridded east-west streets will see the sun setting over New Jersey directly opposite, from the street, along its centerline. The dates of Manhattanhenge usually occur around May 28 and July 12 or July 13 – spaced evenly around the summer solstice. 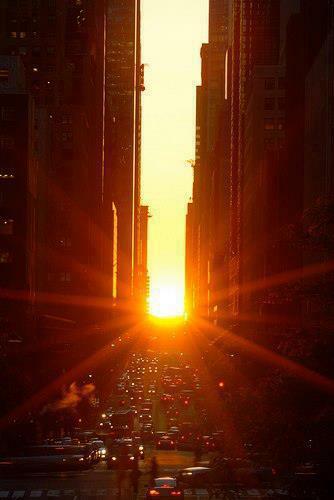 In 2011, Manhattanhenge occurred on May 31 at 8:17 p.m., and on July 12 (full sun) and 13 (half sun), both at 8:25 p.m. In 2012, it occurred on Tuesday, May 29 at 8:17 p.m. and Thursday, July 12 at 8:25 p.m. (half sun), and on Wednesday, May 30 at 8:16 p.m. and Wednesday, July 11 at 8:24 p.m. (full sun).